NEW YORK—Saying they were bored and there was nothing fun to do in the ABC studios, the spunky crew of Good Morning America announced "really big plans" Thursday to write and broadcast their very own television news show all by themselves. The cute little program, which will be produced without any help from any grown-ups, and which will feature important news, interviews with funny people, and also weather, will air Friday at 7 a.m.
"We're gonna write our own scripts and read from 'em and tell everyone in the whole world about stuff that's happening," said George Stephanopoulos, who led the plucky band of lovable scamps and had everybody line up to try their best newscaster voice. "I'm gonna talk about the president." Added Stephanopoulous, "You'll see. We'll be just like a real news show." 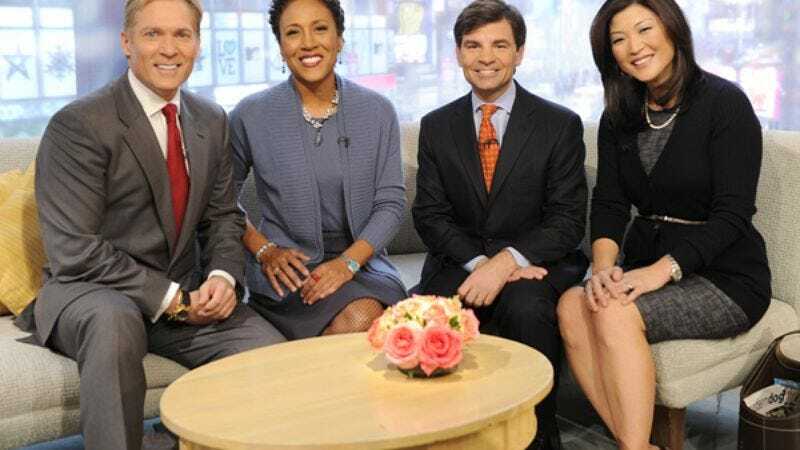 According to ABC sources, the scrappy Good Morning America crew has already begun preparing for their big morning news show, with Robin Roberts organizing the group of happy-go-lucky rascals into teams and ordering them to borrow fancy suits from their parents and gather up as much news as they could find. Juju Chang was reportedly placed in charge of making sure the boy anchors combed their hair nicely to the side. Robin Roberts practices her part over and over and over until she's the best in the world. "This is going to be so much fun!" said Sam Champion, 48, who looked just like a little man in his blue grown-up suit and told reporters that he would be interviewing zookeeper Jack Hanna on the show. "I already have all of my questions ready, like five thousand hundred of them, and they said I could use a microphone when I talk about all the different animals." "But I have to be careful, also, when I pet the little baby koalas," Champion added. "They're delicate!" While certain segments have already been confirmed—including the Hanna interview and a weather piece in which Chang will talk about the clouds and sun and point to pictures of the clouds and the sun, much of the two-hour broadcast has yet to be determined. According to sources, Stephanopoulos has decided to fill some of that time by having Robin Roberts file a report on a suicide- bombing attack that killed 23 in Pakistan this month, but told her not to worry if she did not understand what it was about, stressing that it was more important for her to make a sad face when talking about it. "I'm going to do a good job and talk about very important news events for probably over a whole minute," Roberts said. "I'll also say the words nice and clear so people can understand me, and I'm not going to giggle even once, I swear." With only minutes to showtime and Sam Champion needing to use the bathroom, many at ABC remained skeptical that the plucky band of ne'er-do-wells has what it takes to make their broadcast work. Still, some are pulling for them. "They might not be the most capable or the most informed, but I'll be darned if they aren't adorable trying so hard," ABC News president David Westin said. "Robin and George especially were just as cute as a button when they came marching into my office with all of their grown-up ideas. They seemed so excited about putting on a real news show." Executive producer Tom Cibrowski agreed. "It was absolutely precious how they wanted to do a piece about the Haitian earthquake right before a segment on low-fat additions to ice cream sundaes," Cibrowski said. "If anyone else tried that it would probably come off as insulting or in poor taste, but you can't get mad at these little guys. They don't even know what they're doing up there." "Everyone should make sure and tell them they did a good job," Cibrowski continued. "And that they should be proud of themselves." Good Morning America is expected to be viewed by 4.68 million real, actual people.